NYC Votes organized hundreds of voter registration drives across New York City today to celebrate National Voter Registration Day . Working with dozens of non-profit, corporate, and government partners, NYC Votes held more than 500 voter registration drives in all five boroughs. 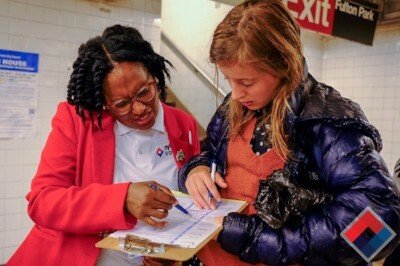 Volunteers conducted voter registration drives at every public library, every YMCA facility, and all four Patagonia retail stores in New York City, among other locations. National Voter Registration Day comes just weeks after New Yorkers turned out to the polls in record numbers for the state primary elections on September 13. Turnout among NYC voters in New York's Democratic gubernatorial primary election increased nearly threefold compared to 2014, with more than 560,000 additional votes cast. The deadline to register to vote is October 12. Eligible New Yorkers should visit voting.nyc and click "Voter Registration" to download a voter registration form today in order to vote in November. "The huge increase in voter participation in this month's primaries proves that New Yorkers are excited to vote in 2018 because they know that elections can have an impact on our daily lives," said Onida Coward Mayers, Director of Voter Assistance at the Campaign Finance Board. "We were so happy to work with dozens of partners on National Voter Registration Day to help more New Yorkers join this groundswell by registering to vote." “Voter registration is the essential first step on a path to lifelong civic engagement. Our institution’s namesake sacrificed his life so that we could have this right. Out of respect for those who came before us, make it your duty to register today." said Dr. Rudolph F. “Rudy” Crew, President of Medgar Evers College. "Local community boards are the entry point to civic engagement and we are proud to be of service to our East Harlem community and their right to vote for a city that works for everyone," said Darlene Jackson, Community Assistant at Manhattan Community Board 11. "As community leaders is it our duty to assist in the democratic process and increase participation," said Ischia Bravo, District Manager of Bronx Community Board 7. "Voting is our civic obligation and the essence of our society. We need to ensure our voice, our needs and our rights are being respected by those who represent us." “The New York Urban League Young Professionals are excited to partner with NYC Votes for National Voter Registration Day. 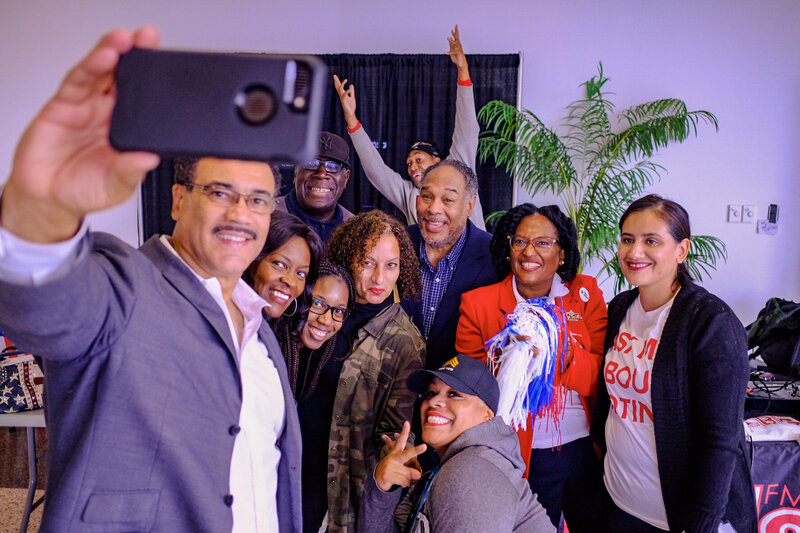 As part of our #BlocktoBallot campaign, a Get Out The Vote (GOTV) outreach and advocacy initiative, we aim to engage eligible voters and ensure everyone has the opportunity to take part in the electoral process,” said Shalima L. McCants, President, New York Urban League Young Professionals. "Voting is the cornerstone of a democracy. Through voting we have the opportunity to influence our government. On National Voter Registration Day we celebrate our role in our democracy," said Muhammad Sattaur, Outreach Coordinator at the Council on American-Islamic Relations, New York Chapter. American Constitution Society (NYLS chapter), Bowery Residents' Committee, Dominicanos USA, Brooklyn Chapter of Jack and Jill of America, Inc., Greater Queens Chapter of The Links, Inc., League of Women Voters of New York City, Legal Hand Crown Heights, Legal Hand Jamaica, Live on New York, Move Forward Staten Island, NYC Veterans Alliance, New York Public Interest Research Group (NYPIRG), New York Urban League Young Professionals, Patagonia, Rockaway Waterfront Alliance, and YMCA of Greater New York. Brooklyn Public Library, City University of New York (All Campuses), Henry J. Carter Hospital, Manhattan Community Board 11, New York City Administration for Children Services, New York City Department of Probation, New York City Department of Records, New York City Parks Department, New York City Human Resources Administration's Family Independence Admiration Operations, New York City Department of Health and Mental Hygiene, New York City Department of Homeless Services, New York City Department of Transportation, New York City Small Business Services, New York Public Library, Office of the City Clerk, and Queens Public Library. Alpha Kappa Alpha (Delta Rho Omega), Delta Sigma Theta Sorority, Inc. (Bronx Alumnae Chapter), and North Manhattan Alumnae Chapter of Delta Sigma Theta Sorority Social Action. Join the conversation on NVRD on social media using the hashtags #NationalVoterRegistrationDay and #NYCVotes.